This could be the end for Scott Pruitt: Last Friday, the New York Times broke the story that, Pruitt wined and dined a Roman Catholic cardinal who also is accused of “multiple … sexual offenses” just because the cardinal doesn’t believe in global warming. Then he tried to cover it up from the press and the public by changing FOUR. DIFFERENT. PUBLIC. ACCOUNTS. Congress is angry (as they should be) but that may not be enough. There are indications that last month, when he testified before a House Committee, Pruitt may have lied and omitted information – as he has done many times before with the press and public – and therefore broken the law, again. Can you click here to find your member of Congress’ local office and deliver our petition tomorrow at noon? You’ll be provided with a two page delivery packet and training guide to make sure everything goes smoothly. Then, call 844-881-1311 tonight at 6pm Eastern / 3pm pacific, and Senator Bernie Sanders and FOE President Erich Pica will tell you all about it (Drew will be helping manage the Q&A line with other volunteers). Time and again we’ve seen scandals about Scott Pruitt, and thought to ourselves ‘this time he’s done for’. 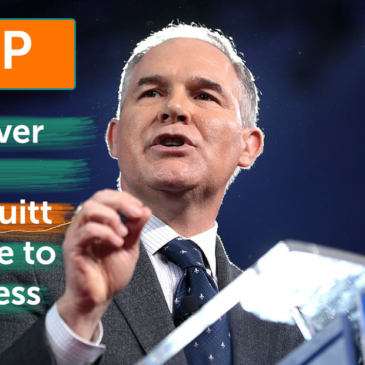 But every single time, Donald Trump has stood by his man because he appreciates the work Pruitt is doing to destroy our environment and poison our public health on behalf of big polluters. The White House Press office says they “hoping” Pruitt can address the scandals at his hearing next Wednesday. We need to show up in force and make it clear that Pruitt can’t cover up or explain away his misconduct. We’ve got everything you need to deliver a powerful message. Just click here to find your member of Congress’ local office and deliver our petition tomorrow at noon. You’ll be provided with a two page delivery packet and training guide to make sure everything goes smoothly. When you arrive take a picture of yourself holding up the first page in front of the office. Then head inside and deliver a copy of the second page, which has a copy of the petition we all signed. Finally, post your pictures on social media using the hashtag #FirePruitt and we’ll share them with activists and reporters all over the country. If you’re ready to Fire Pruitt, get your materials and then call 844-881-1311 tonight at 6pm Eastern / 3pm pacific. Senator Sanders and members of our #FirePruitt coalition will tell you all about how we’re going to win.